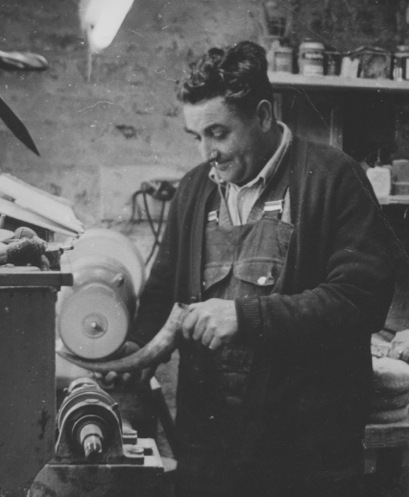 Countryman, mole catcher, gardener, fencer, school bus driver, fiddle-maker – but perhaps Cameron Thomson is best known as the Horn Carver at Lawers. This month we talked to Cameron for our occasional series Talking About Fearnan. 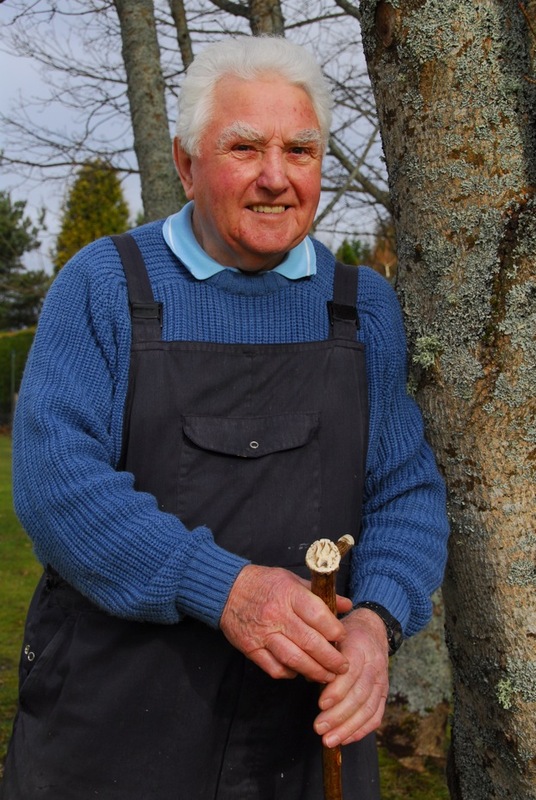 Cameron was born and brought up on a farm in Aberdeenshire and came to the Fearnan area in the early 1960’s, via the Kindrogan estate at Kirkmichael, where he worked as a handyman and gardener. 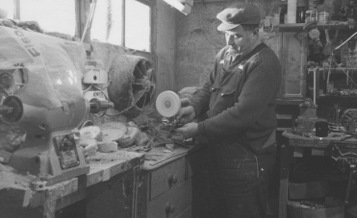 From boyhood, he had always enjoyed carving and making things, often getting into trouble from his mother for making a mess by whittling the sticks in the log basket by the fire. 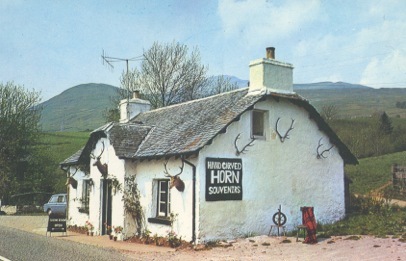 Around the time that he came to Fearnan, he decided that he wanted to make more of his hobby, and have a proper workshop along with a showroom from which to sell his horn carvings. The Old Toll House at Lawers, which was lying vacant and semi-derelict, was ideally placed on the lochside road so he approached its owner. The deal he struck with the farmer was a price of £10, plus annual farm work. This proved to be a real bargain, as the farmer moved away after the first year and so the second part of the contract was cancelled! Cameron set about renovating the Toll House. It was full of hay and slag, and was home to rats and some chickens. Unbeknownst to Cameron, there were some other, more transient residents. The cottage, in its derelict state, had long been providing a sleeping place for the Tinkers, or Travellers, who moved around Highland Perthshire plying their trade as tinsmiths. For nearly a year after its purchase, weary figures would turn up around dusk expecting a good night’s sleep in the hay – only to find they were out of luck and had to continue on their way. Whilst Cameron was very proud of his renovations, the Tinkers were less impressed. One of them curtly informed him that he had “ruined the place”! Cameron’s late wife, Martha, had been concerned about this new venture. It was a big undertaking, how would he keep it stocked? And who would come to buy? However, all doubts started to fade after the first day’s trading, when they realised they had taken the equivalent of a week’s wages across the counter in a single day. It was visitors to the area, rather than locals, that were his main customers and they came to buy crooks, horn buttons, egg and porridge spoons, shoehorns, buckles, lamps, crooks, whistles and more, all carved from antlers, sheep or cow horn. Over the years, his work has featured almost every bird and animal from Scotland. Although the main tourism season was the busiest time, visitors to the shop would often order something specific to be made, and these orders kept him going up to Christmas. Cameron is particularly adept at carving crooks from ram’s horns, which he would combine with hazel shafts gathered in the woods around Loch Tay. Over the years he has received a number of special commissions for his crooks, including one for the Bishop of Sudan and one made for a former Prime minister of Australia who was visiting Castle Menzies. His skill in carving is not confined to horn. A fiddle player himself, he has made more than 20 beautiful fiddles and of all the things he has made, he is particularly proud of a model of a horse and cart carved from a single piece of wood. As befits a fiddle maker, Cameron has always had many strings to his bow. One important role was to be the driver of the school bus for a period of some 27 years, starting early in the morning to bring the older children from along the lochside into Fearnan, where they were able to pick up a bus to the secondary school in Aberfeldy; then collecting and taking the wee ones to Fearnan Primary School. He remembers some of the bad winters, when the snow fell heavily and the snowplough piled big heaps on the verges, making the road to Lawers more like a bob sleigh run. It has to be said that not everyone was overly pleased to see the school bus approaching! More than one child boarded the bus in trepidation at the prospect of his or her first day at school. In one extreme case, after all methods of persuasion had been tried, the child in question had to be left behind, screaming and kicking in the middle of the road. The bus had to leave so that the rest of the pupils got to school on time. Cameron thoroughly enjoyed his role driving the school bus; he knew all of the children’s names and would hear their news and stories of what had happened in school that day. His favourite time of year was always the period leading up to Christmas when the children were learning Christmas Carols in class. On those wintry afternoons, as it wove its way along the side of the loch, the bus would be filled with the sound of their young voices, practising their newly learned Carols. It was a sad day, in March 1968, when the falling roll meant that Fearnan School had to close. However, in his speech marking the last day, the minister quipped that it was thanks to the efforts of the (many) McLarens that the school had managed to keep going for as long as it did! After this, Cameron continued driving the school bus for the few remaining pupils, but took them to Kenmore Primary instead. 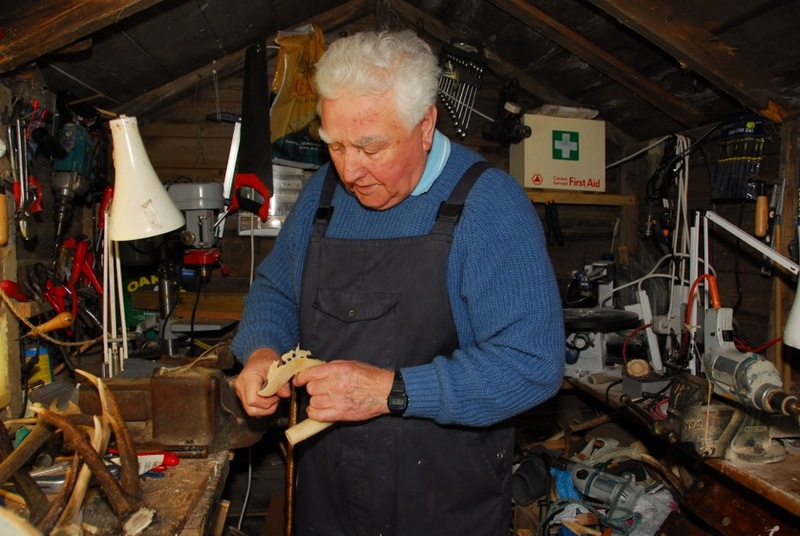 Cameron will be 90 next year but is still very active, and despite having cut back a bit, he continues to help maintain 4 gardens and undertakes a whole range of handyman projects. He still catches moles, but not as many as in the days when he was contracted by the Ministry of Agriculture to trap moles on some 1100 acres of farmland round the loch. Cameron’s whimsical wee cottage is like something depicted in a fairy tale. Lovely cottage, lovely story. Sorry Tinkers!